YEREVAN—A day after Armenia’s parliament failed to elect opposition leader Nikol Pashinyan, thousands heeded his call and staged a general strike, closing major roads in and around the capital, as well as key transportation facilities bringing traffic to a virtual halt, all in response to the ruling Republican Party of Armenia’s decision Tuesday to reject Pashinyan’s candidacy. Groups of Pashinyan supporters blocked streets and major highways, among them the main thoroughfare to the Zvartnots International Airport. The protest actions, which were largely peaceful, were supposed to continue until, what Pashinyan called the “surrender” of the Republican Party of Armenia. 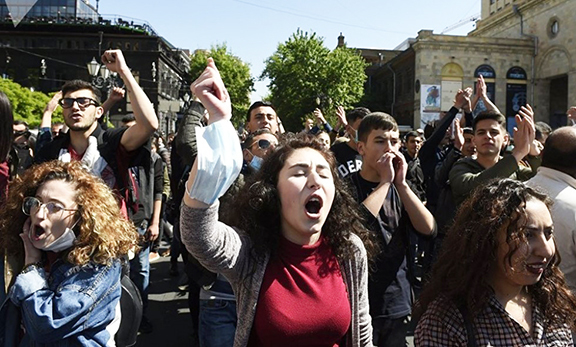 Wednesday’s protest also reflected the people’s resolve in a movement that began on April 13, to oppose the April 17 election of by parliament of former president Serzh Sarkisian as the country’s prime minister. The protests accelerated and grew forcing Sarkisian to resign on April 23. Parliament was poised to elect Pashinyan as the new prime minister on Tuesday, but the Republican Party of Armenia thwarted that effort when it announced that its lawmakers would reject his candidacy, hence not providing Pashinyan with the 53 votes to be elected. Evidently, the movement was able to make an impact. By Wednesday evening, the Republican Party of Armenia’s parliamentary faction announced that it would not introduce its own candidate for the newly schedule prime minister vote on May 8 and would vote for what it called the candidate who enjoys the support of one-third of the legislature. This announcement prompted Pashinyan to urge his supporters to end the main road blocks and at a rally at Republic Square, which has been the setting for the better part of the movement, called on his supporters to suspend the protests. He urged students to return to class and all other to resume their lives. Wonder how the oligarchs behind their gated compounds are taking in all of this. They’re surely not going to give up their privileges too easily. They desperately need some cunning advise from their Russian counterpart. That is called “The power of the people”, the first power liberated Artzakh, this second one toppled the rule of the Republican Oligarchs. Long live the Armenian people’s power to create the third one, the prosperous Armenia.